You are here: Virgin Islands News Online » News » VG Summer Jam Basketball League is back! 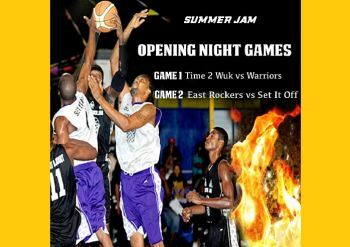 23 teams across four divisions, including four 40 plus teams representing Virgin Gorda, East End, West End and Road Town, will be battling for top honours in a revamped VG Summer Jam 2015. The “B” Division, aimed at 14-19 year olds with a total of seven teams, tips off after the Opening Ceremony scheduled for 7pm. Warriors and Let It Loose will then clash from 8pm and that game will be followed by the “A” Division mouthwatering matchup between Set It Off and East Rockers. The “A” Division, aimed at the 20 and over age group, includes nine (9) teams and there is also a “C” Division featuring three (3) Under 13 teams. Admission for VG Summer Jam 2015 is free and existing Ferry Services should mean players and fans from Tortola can easily get to each game. Sponsors are also getting back into supporting VG Basketball with the Rock Café, Mr Nice Guy, Speedy’s, Nagico Insurances and the Department of Youth Affairs and Sports already signed up. how they got two big leagues going on at the same time eh? it is so it goes...been so. Exactly.. They just start and want to take over.. Summer Jam been around for years!!! Summer Jam used to open during the first weekend in July, Summer. The purpose being that players home during the Summer and students at home would get to participate. However, due to lack of good management and an actual committee the one-man show begins in September, after Summer! When school is back in session and the focus should be the new school year. Da make sense? You are to blame for this mess. The players can't even practice during the week because the one-man committee has the rim up. Da make sense? You to blame for this. Now the REAL Basketball League is going to begin! Are the politicians trying to out do each other? Never!!! VG own been the best! will the ferry come back directly after the game? NO so plan to sleep over there! Please do not make basketball a political issue. For decades BVIslanders have loved the game. Attend any of the games that you can and enjoy yourself. all the leagues are crap. just a waste of time. let the kids have the gyms and move the old $$ cry babies outside and for recreation.